Paul and Karen*, age 63, have a $350,000 home with a mortgage of $112,900 left. They have $15,000 in credit card debt, and they have an anticipated cost of $15,600 for healthcare costs before Medicare will kick in. They would like to find a way to offset their healthcare costs and pay off their debts so they can retire. 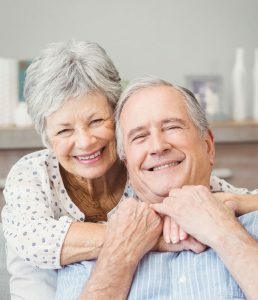 If they qualify, Paul and Karen could use a reverse mortgage loan to refinance their current mortgage, cover their other debts and their anticipated healthcare costs. *The persons depicted herein are fictional and any resemblance to actual persons is a coincidence. The story is used for illustration purposes only. House may not be available for purchase. This information is provided as a guideline; the actual reverse mortgage available funds are based on current interest rates, current charges associated with loan, borrower date of birth, the property sales price and standard closing cost. Interest rates and loan fees are subject to change without notice. Many people feel that paying off their home and having no mortgage with lots of equity is the Holy Grail of retirement. Several people wait until their home is paid off before they retire and then feel they are safe to do so. The truth is that home equity is good, but it is not great because it is not liquid. In the face of fluctuating home prices along with nursing home and long-term care threats, it is typically better to have your equity in cash and in a form that you can control instead of relying on uncontrollable factors. If you can use home equity without risk of foreclosure from missing payments, then the old rule of having a paid-off home in order to be secure may no longer be the best option. The truth is that a home is a great place to store memories but not a great place to store assets. Once you understand that home equity is good, but cash is better, then the three buckets illustrated above will make a great deal of sense. During our earning years, we take money from the first bucket – W-2 Income – and put it into the second bucket – Retirement. What we also do is put quite a bit of our income into the third bucket – our home – purchasing it, making payments, improving it, etc. When we come to retirement, it is normal and expected to start drawing from bucket #2 (and stop contributing). Our first bucket decreases into just social security and pension income. However, most people continue to put money into bucket #3 when they don’t need to. They sometimes continue to make payments when there is more than enough equity in bucket #3 that they should let that bucket take care of its own expenses as well as give them a cash flow that is not taxable. What they don’t realize is that with a reverse mortgage, they can take cash out of bucket #3 just like bucket #2. 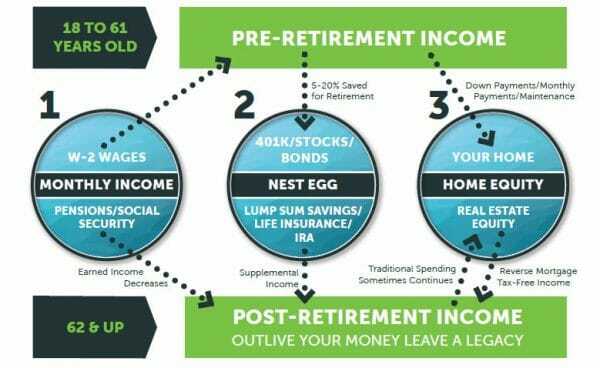 Note the direction of the arrows and how they should change to maximize your retirement income on the lower rectangle. If you adopt this strategy as proven by the Texas Tech research1 and Boston College for Retirement Research,2 your retirement funds will give you more income and be far more likely to outlast you! This is a big mental paradigm change. However, it is very important for you to understand that retirement rules, from taxation to home equity and especially long-term care issues, are simply very different from what happened during your earning years. Retirement is a different game and has different rules. The better you understand those rules, the better your retirement income will be. Let us explain why bucket #3 is so valuable for your retirement. 2Ellis, C. D., Munnell, A. H., & Eschtruth, A. D. (2014). Falling Short: The Coming Retirement Crisis and What to Do About It.